Scars are left behind my skin conditions (such as acne and pimples), or by injuries caused by accidents, surgery, and other factors. The scars that are formed on the surface of the skin can leave behind unsightly marks that adversely affect the overall appearance of a person – especially if the scars are located in an area that is highly visible to others. What Causes a Scar to Form? Scars are the results damage to the skin, and are normally preceded by the formation (and eventual healing) of wounds. The wound-healing process starts with inflammation, and then progresses to tissue formation; the wound healing process ends with modifying specific factors in the anatomy – such as collagen (the main protein found in connective tissue that supports the skin, cartilage, bone, and blood vessels). Scars are formed when the wound-healing process is not allowed to progress in a normal or correct manner by a number of factors, such as too much or too little collagen. Hypertrophic Scarring: Characterised by pink, firm and raised scars that remain within the initial wound area; this type of scarring may fade with the passage of time. Keloid Scarring: Characterised by reddish-purple, firm, and raised and scars that extend beyond the initial wound area; this type of scarring can build up with the passage of time. 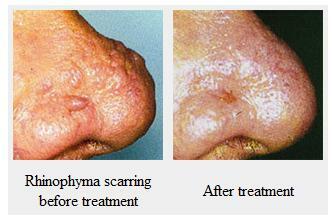 Atrophic Scarring: Characterised by depressed pin-like pockets in the skin that can result from diseases or skin problems, such as acne. Laser treatments are used to improve or eliminate scars on the surface of the skin. The laser treatments will effectively work deep within the layers of the skin, so that new collagen and skin cells are encouraged to regenerate to repair the damaged tissues caused by the scars. It should be noted, however, that not everyone is a good candidate for laser scar treatment; it is not recommended for individuals who have skin disorders such as cystic acne, psoriasis, and dermatitis. Patients who are taking certain medications such as isotretinoin for acne are advised to stop using the medication for six months prior to the laser scar treatment procedure. The physician will inspect the patient’s scar before proceeding with the actual laser scar treatment, to assess if the laser treatment will be a suitable option for removing the scar. Numbing of the area with anaesthesia may be necessary, depending on the size and depth of the scar that will be treated with the laser procedure; there may be cases when a general anaesthetic may be necessary, to ensure the absence of discomfort for the patient. The laser scar removal procedure is done as an outpatient treatment procedure in the Woodbury Dental and Laser Clinic in Kent, and can take a few minutes to more than an hour to be finished (depending on the size and depth of the scar). During the laser scar treatment procedure, the laser is moved along the whole length and width of the scar. The laser will effectively vaporize or remove the damaged layer of skin, and will encourage the exposure of a more natural-looking skin layer, which will in turn heal with the passage of time to minimize the appearance of the scar. Other laser treatments may work on the lower layers of the skin, encouraging the production of new collagen and correcting scars from the inside out. Improved Skin Appearance – Scars often lead unsightly marks on the skin, and may even deteriorate with the passage of time. Laser scar treatments effectively minimise the appearance of scars, and can even be successful in removing all traces of the scar altogether, on the patient’s skin. The result is blemish-free skin that does not have a trace of scarring. Minimal Discomfort – Depending on the scar that needs to be minimised or removed, there is very little discomfort associated with laser scar treatments. Anaesthetics can be administered as deemed appropriate by the physician, to ensure the complete lack of discomfort during the entire laser scar removal procedure. Little to No Down Time Needed – Majority of the laser scar removal procedures require very little to no down time for the patient; this means that the patient can go back to doing normal activities right after the laser scar treatment, and will need very little to zero recovery time as well. Laser scar treatments enable patients to have the scar improvement or removal they need, without the possibility of the procedure interfering with their hectic or busy lifestyles.